You may want to replicate the effect Rudy Huyn used in his app 6snap. He basically uses an image sliding effect on the login page of his app. As you can see, the background image slides to the right, and then again returns to the left and continues to do the same. To get started, create a new Windows Phone project and add a wide image to your project. We are insisting on a wide image so that the slide-in animation shows properly. This code XAML code was generated on using Blend along with double animation. Credits to Siddharth Ajmera, MSP who reproduced similar effects in his app course8 and was generous enough to share the code. Note: Replace the image’s source with the image that you earlier added to this project. We have to begin the animation on the page’s OnNavigatedTo event handler. That’s it. Run the app in the emulator and everything should work as expected. Here’s a link to an awesome video by Bob Tabor from the series Windows Phone 8 for absolute beginners on Animations in XAML. You can download the full source code of this project and use it as a reference. In the last post of this series I gave an introduction about how one could send and receive push notifications in Windows Phone 8. In this post I am going to discuss toast notifications. There are three parts to this tutorial. We need a webpage that sends a toast notification by using the URI that is returned when the push channel is created on the device. The MSDN website explains how this can be done using ASP.NET but in this tutorial I will be using PHP to setup a push notification system on a server. You will be needing a domain and hosting to setup your notification service on the server. If you don’t have any website then sign up for free on 000webhost.com and get free domain and hosting. They provide hosting absolutely free, there is no catch. You get 1500 MB of disk space and 100 GB bandwidth. They also have cPanel control panel which is amazing and easy to use website builder. Moreover, there is no any kind of advertising on your pages. You will need a database table. From the cpanel of your hosting account add a new MYSQL database and assign a user with all privileges to it. I use a godaddy account but your cpanel will also have similar options. Once you create a database, add a new/existing user who can manage that database. Now open phpmyadmin from cpanel and login. 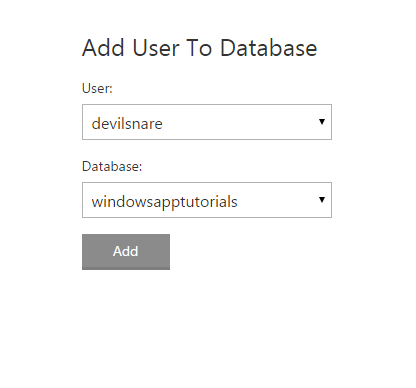 You will need to create a new table in the database `windowsapptutorials`. My table’s structure is shown below for reference. Go to your file manager using cpanel and browse to public_html folder in it. Create a new directory in it and add a new file to it. Name the file config.php. This script will be used to connect to your database. Our client app will send us a request with a notification URI (we call it GCM id) and we need to save it in our databases so that we can send notifications to it later. Create a file userid.php which will take a $_GET request containing the URI and add it to the database. It will also return the user id to be used by the client for updating URI for a device. It increments the <id_no> and gets an encoded gcm id (URI) from the URL. Finally it echoes the incremented userid which the client app saves locally in its isolated storage. The notification URI keeps changing every few days and you will need to update the existing URIs to continue sending messages to the client app. For this purpose let us create another file updategcm.php which will take $_GET parameters userid and new gcm id (new URI) and update the URI corresponding to that userid in our database. You would have heard about Rudy Huyn, the famous Windows Phone developer. He wrote a PHP script to send push notifications to windows phone 8. Here’s the project on codeplex project link. Just visit this link and download the windowsphonepush.php file. Add this file to the same folder where you have placed other PHP files created above. You can send toast notifications, tile notifications or raw notifications using windowsphonepush.php. push_tile function sends a tile update with count, title and background image. push_delay values specify the delay with which the notification should be delivered. The introductory article of this series had a table of values for different delay times. Lastly add a PHP script that will select all URIs from the database and send notifications to it. This PHP file has windowsphonepush.php included to it.